How Can I Get My Nails Clean and White? Use one of many inexpensive home remedies to polish your teeth. 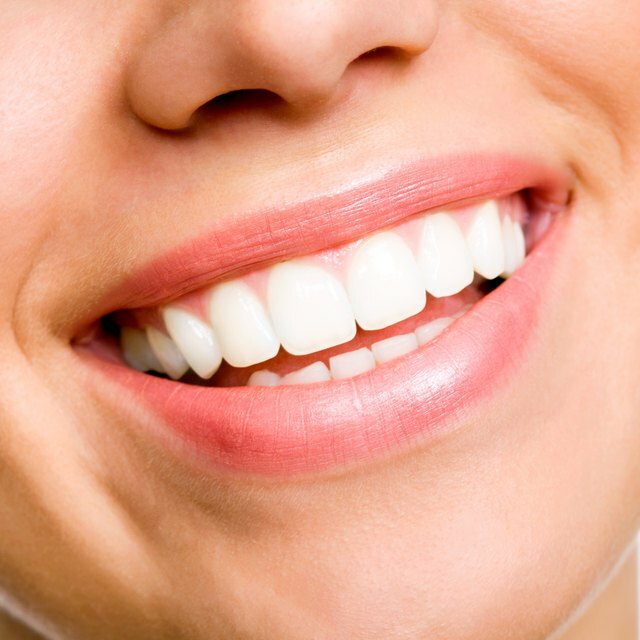 1 What Natural Things Can Make Your Teeth Whiter? 2 Are There Easy Ways to Whiten Teeth Without Whitening Strips? An enthusiastic smile can be your best accessory, but sometimes food and drinks can change the appearance of your teeth. Many foods that are high in citric acid can wear away your tooth enamel over time. Drinks such as coffee or tea can discolor your teeth, making them look dull and tarnished. You don’t have to spend a lot of money on expensive tooth whitening creams or gels, and you may not always have to make a special trip to the dentist. With a few key ingredients, you can make your own natural tooth polish. Mix ½ teaspoon of finely ground sea salt with 1 teaspoon of baking soda in a small bowl. Add just a drop or two of peppermint oil and a few drops of water. Just use enough water to create a thick paste that will stay on your toothbrush. Polish your teeth with this mixture and rinse. The baking soda will gently clean your teeth and remove stains. Wet your toothbrush and dip it into salt. Add a few drops of lemon juice to the toothbrush. Apply this grainy mixture to your teeth, and let it stay there for a few minutes. Gargle and rinse your mouth thoroughly with warm water. The salt will act as a mild abrasive, and the lemon juice will remove stains. Peel an orange, leaving as much of the white part on the peel as you can. Rub the inside of the orange peel across your teeth. The white insides of an orange peel will help polish your teeth and restore shine to the enamel. As an added bonus, the vitamin C in the orange peel is good for your gums. Use a neem branch in place of your toothbrush a few times each week. Neem tree branches are useful for many different health issues, including oral care. Chewing on a neem branch will polish your teeth and remove yellow stains. You can also grind it into a powder or paste. Crush a few strawberries to make a soft pulp. Mix baking soda until you have made a paste that will stay on your toothbrush. Rub the mixture on your teeth, and leave it on for five minutes. Rinse completely, and floss to remove any stray seeds. Malic acid in strawberries will remove surface stains on your teeth and is a natural way to polish them. Try mixing cinnamon bark or clove with baking soda instead of peppermint oil. Any essential oil of your choice will work to flavor the mixture. Be sure to rinse lemon juice completely from teeth as the acidity in lemons can weaken tooth enamel.